Did you know – 92% of searchers choose the results that appear on the first page of searches? The ever-growing intervention of the internet in the lives of an ordinary man has made us to believe that the solution to every kind of problem rests with Google. Thus, it is an undisputed fact that all students turn up to Google to find the best college, university and educational institutions for their higher education. So, the question arises: How to get on the top of the list of search engines? The answer is strategic yet straightforward to implement: SEO for universities. Search Engine Optimization (SEO) for colleges and universities is a planned effort by a marketing team with the aim of gaining higher search engine rankings for the websites and other pages present on the net. It gives them a competitive edge over their competitors. 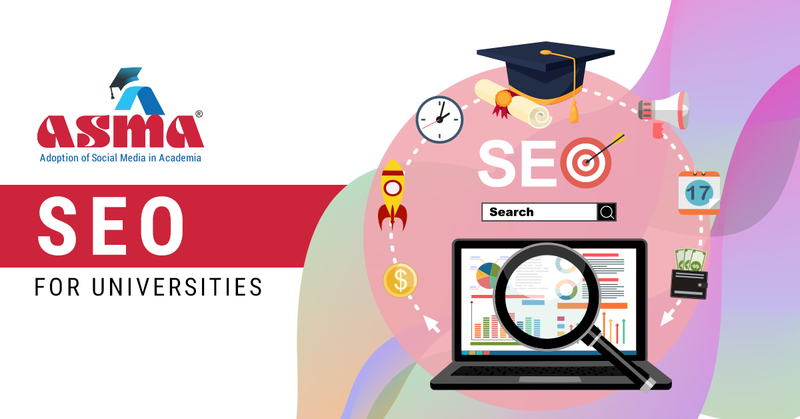 SEO for education websites is carried out by posting relevant and meaningful content about the institute, amenities, admission procedure, faculty, extra-curricular activities and much more to attract the prospective students. By integrating keywords and inserting required links, it is possible to improve rankings through organic marketing. Universities and colleges can optimise their websites so that they can appear on top during online searches. It is interesting to note that the search engine optimisation for colleges and universities is a crucial determinant of the admissions’ success rate. The more one capitalises on the power of content marketing through SEO; higher is the probability that their college will receive a favourable response during admissions. 72% of marketers believe that content marketing is one of the most effective SEO tactics! Here are some of the benefits that would compel the professionals to adopt SEO for their universities and colleges. As SEO strategies improve the ranking of an institution, its online presence gets strengthened. The chances of appearing in the list of top institutes increase manifold when searched online. SEO yields top rankings that invariably build a brand image on digital platforms. It helps in creating organic search engine traffic that is valuable for admissions. Search engine drives 93% of all website traffic. So, the colleges utilise their brand power for attracting prospective candidates. Apart from taking reviews from references and other human and print resources, students turn to Google to find the best colleges in their chosen domain. 90% of searchers do not have a specific choice for brand before starting their search. They believe in the online results while considering a college into their choice set. With an appreciable ranking on a search engine, an institute can become the preferred choice of a student. With the help of proper SEO based tools, it is possible to track the traffic diverted to and visitors on the website. This empowers the marketers to focus on interested students rather than targeting a general set of the public. Thus, SEO helps in reaching to the target audience and converting leads into customers. It’s time to stand out of the crowd! This is a high time when universities and colleges should realize the significance of SEO in attaining desired admission outcomes. Investing in SEO is a sustainable strategy that imparts consistent and measurable results. The implementation of SEO in the vertical of education is a welcoming step that has empowered the students and institutes to get the best.